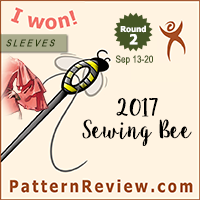 As promised, a pattern review for my “Aes Sedai” dresses. 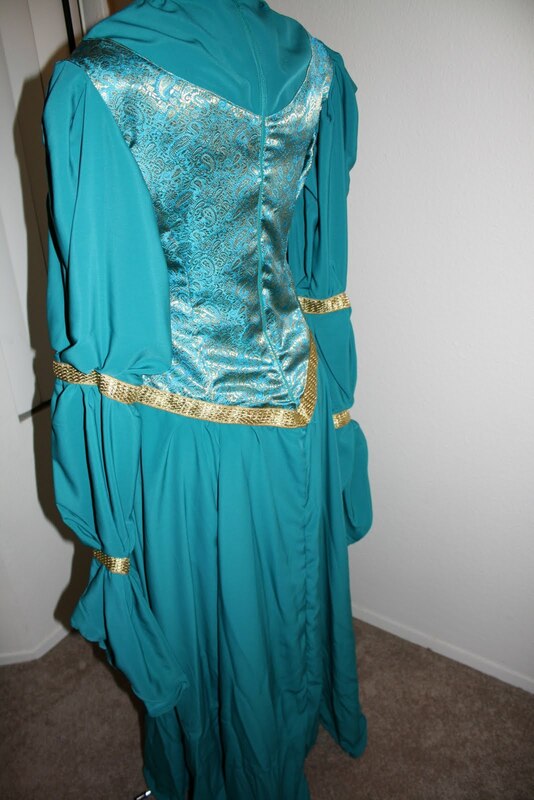 Luckily, since the movie release of Lord of the Rings, fantasy inspired costume patterns are not too difficult to come by. 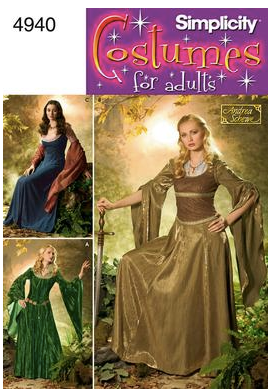 Sadly, all of the shapes are similar to those worn by Arwen and Eowyn. 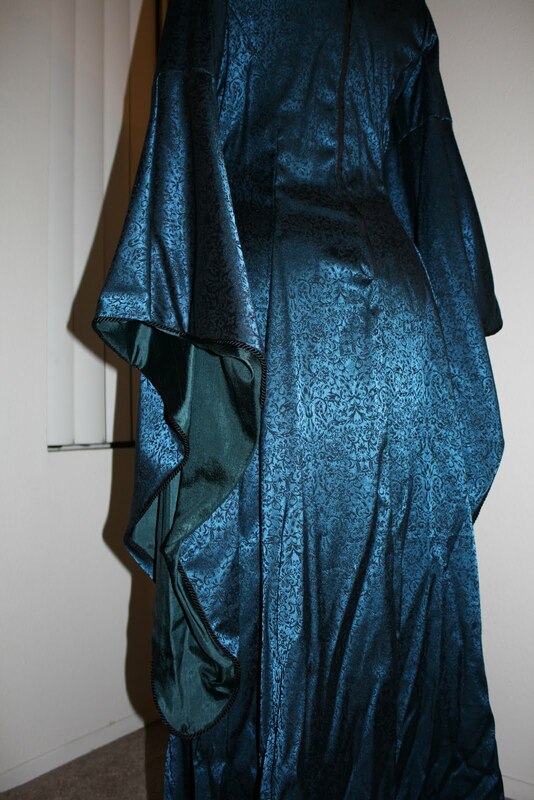 So I decided to make two dresses: one directly from the pattern, and one where I would alter the sleeves a bit so the look wasn’t quite so LotR or evil queen. 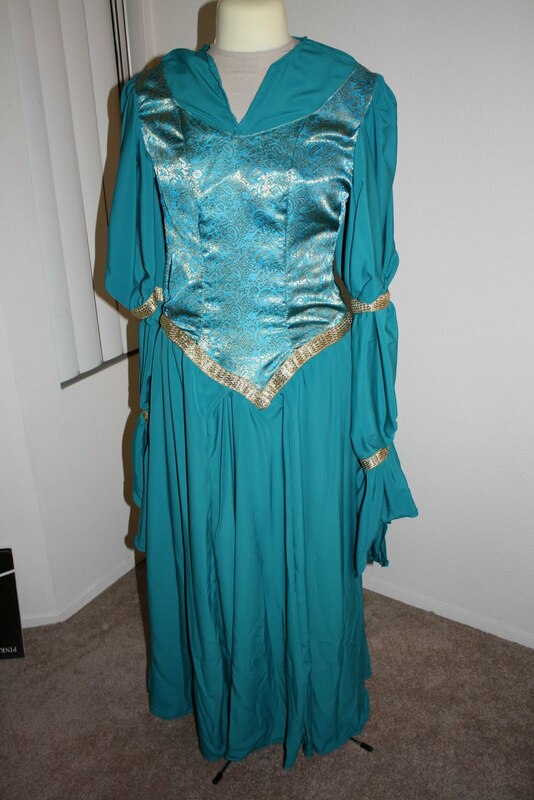 Pattern Description: Fantasy costume in Lord of the Rings style with long sleeves. Pattern Sizes: Available (10-18) and (20-26). I cut a size 16 top/18 bottom for view A, but this was before I knew much of anything about altering/fitting commercial patterns. I have also lost weight since I first made this, so if I were to make it again, I would cut a size 12 on top grade out to a size 16 for the skirt and do a FBA (full bust adjustment) and other pattern adjustments. Did it look like the photo/drawing on the pattern envelope when you were done sewing with it? Yes, I thought my first costume looked very similar to view A, since I followed the pattern exactly. My second dress was a bit different since I made my own sleeves. This was during my “Interfacing, what is that and who needs it?” phase of learning to sew, so my collar is a bit more droopy than the one in the picture. Were the instructions easy to follow? Yes, the instructions were quite simple except for the collar. I found that sort of confusing/difficult, but I did figure it out by going slowly and doing everything exactly step-by-step from the instructions. 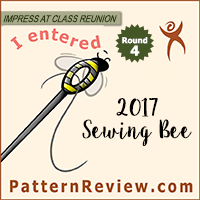 What did particularly like or dislike about the pattern? The princess seams made it easy to adjust the pattern to fit, even if you don’t really know anything about fitting patterns. Also, it will look good on many body types because you can use the seams to get a nice fit to the body. I like the overall style of the dress and the sleeves are so fun and pretty! Fabric used: My first costume used polyester brocade and the second I used some sort of soft flowy polyester for the skirt and a poly brocade for the top. Pattern alterations or any design changes you made: The first time I made view A with no alterations. 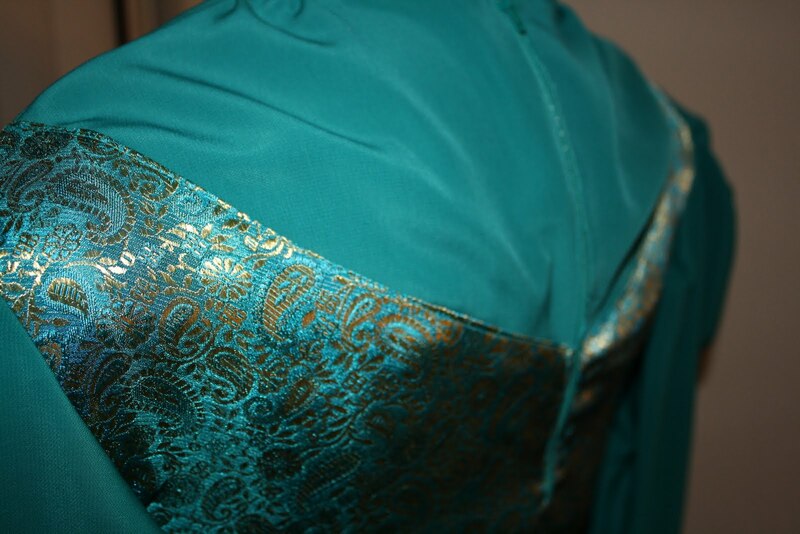 The second time I changed the sleeves, made the view B neckline, and sewed the bodice directly onto the skirt. Would you sew it again? Would you recommend it to others? I would highly recommend this pattern because it so pretty and easy to make. I would like to sew it again, using some of the different bodice and sleeve options, and make more pattern adjustments, now that I know more about sewing pattern sizing and necessary adjustments. Conclusion: Great pattern! Love the look, the sleeves, and the ease for making it. It was one of the first things I made after learning to sew, so overall I think the pattern is very easy for beginners, but does offer enough of a challenge (with the collar, for example) that it isn’t completely boring to make. Also, the results are so pretty! Ok, now for some pictures! The dresses don’t look the best because (1) they are now too big for both me and my dress form and (2) there is some decidedly sloppy sewing going on here. I would love to re-do these, and maybe will think about it after I finish some projects that I want/need to finish before the end of summer. My first dress – view A. It is far too big around the shoulders and waist now. Fabric close-up. It is really a lovely dark blue/black mixture, but sadly camera shy. My sleeve with lining. I also added a black rope trim. The back. Love the drape of the sleeve. Not loving the exposed wonky zipper. That needs to change. For this dress I would like to: replace the zipper with an invisible zip, make the top smaller with an FBA, possibly change the collar to a contrasting fabric so it stand out more. 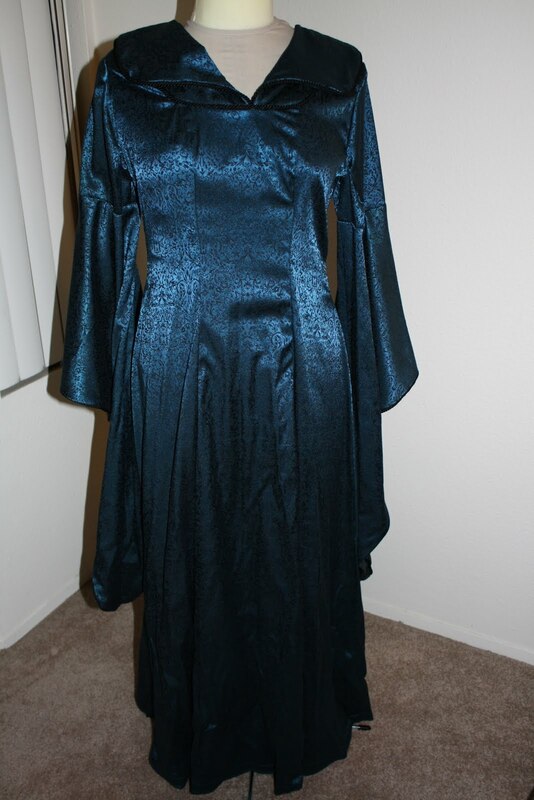 Happily, since I have been dropping sizes and not gaining them, there should be enough fabric in this gown for me to make the changes I want to make. My second dress was very similar, but with some design changes. Love the color on this dress! I like that this dress is more soft and floaty whereas the first was more structured. 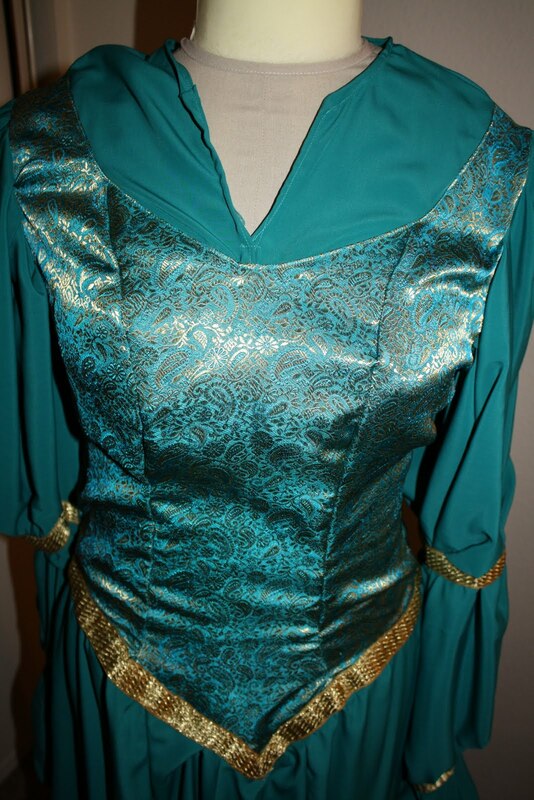 The sleeves are more poofy and romantic, and the neckline is much softer as well (using view B). 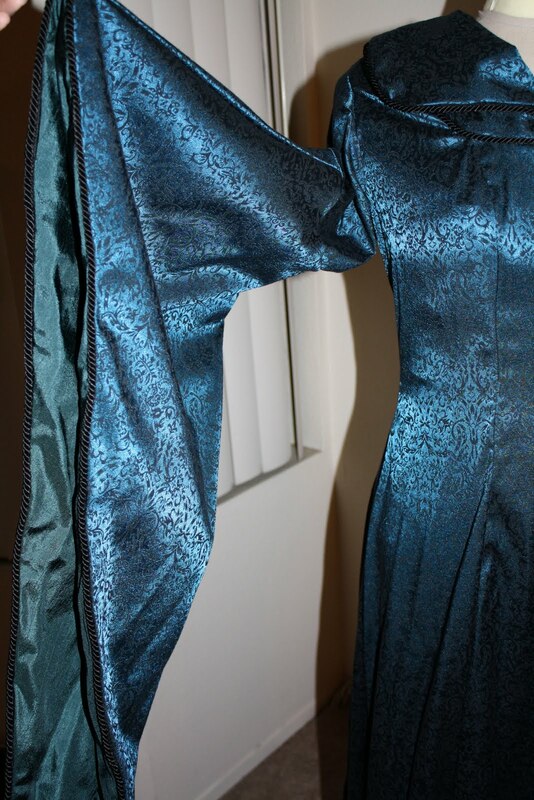 I sewed the bodice on as part of the dress, instead of having a separate piece as used by the pattern. I love the sleeves, colors, and trim on this dress more than on the first one, but this dress needs a lot more work in the upgrades department. Pretty brocade shows bad stitching. 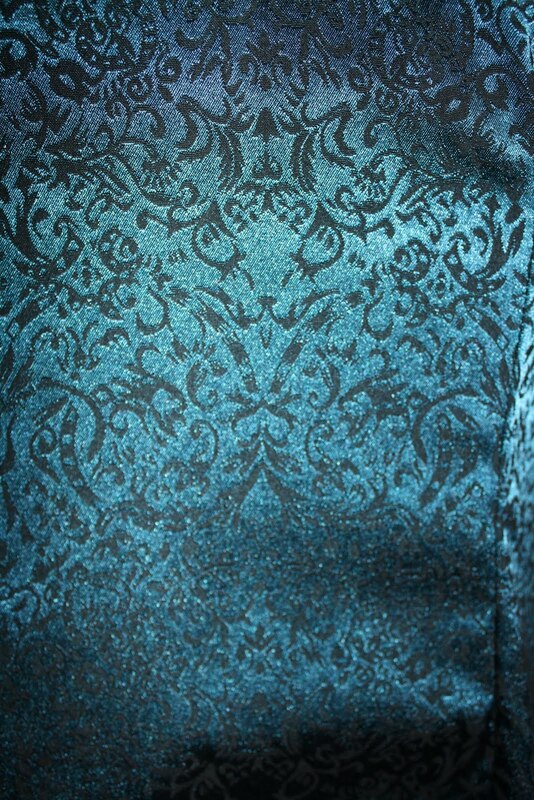 I love the brocade I used for the top, but, being inexperienced, I never thought to underline it, and it hasn’t held it’s stitches well over time, despite decided lack of use. So before I really wear this one out on the town, the bodice needs some major re-doing. Underlining is a must, as is size changes and alterations. I think the underling would also fix the puckering on the stitches. You can see how incredibly wide the shoulders look – they are falling off the dress form. Also the skirt has some very messy sewing near the front – that also needs to be fixed. I do think this was a better zipper insertion, but I would also like to go for an invisible zip on this dress. Eventually I would like to make more realistic costumes without zippers (using more historical type closures) but I don’t think I have the need or experience to do that when I re-work these costumes. Also – what is with that back skirt seam? I don’t know why I didn’t re-do that at the time because wow it is racking something awful. Brocade pattern and too big shoulders. Overall, I love my fabric choices, but I am not super pleased with my results in hindsight. I wouldn’t exactly call them “successes” as of yet, but they did make me start thinking about fit and how I could make things better. Really, the fact that these costumes weren’t perfect was probably a good thing, because otherwise I would still not know or care that patterns are sized for B cups, about upper bust/full bust measurements, or anything about pattern adjustments other than basic lengthen/shorten lines. This was when I first started thinking about fit and technique and all sorts of things that I had avoided with my first projects (the loose Yuko robe and skating costumes). So I suppose, in a sense, that these projects were useful to me if not exactly successful. I would like for these gowns to be wearable, and so I think they will get some major alterations/re-working in the future, but, like my Yuko costume, are not exactly a priority at the moment. I would love to make this costume again, perhaps with the gathered sleeve in some sort of a deep blue shantung and then make some sort of bodice/corset similar to view B but with more structure (perhaps in a textured velvet? I am liking this idea). Perhaps closer to Halloween/October I might be feeling the costume re-vamps, but right now I am more interested in increasing my wardrobe options for summer. what did you think about the ease of movement in the first dress? I am considering using the c view (with a different lower sleeve) for a dress, but I need to really be able to use my full range of motion as I plan to be doing some combat in it! How well were you able to move your arms? Run (if you ever did that)? As I recall (and it’s been a while) the movement on the arms from the pattern as drafted is a bit restrictive, but in my altered second version (the lighter green/gold) there was decent movement. If you really need to be able to move, I might suggest doing the sleeves in a knit, or, if you are trying to be screen/historically/theoretical fantasy accurate then perhaps adding a gusset to the sleeve to allow greater range of motion.